Easy weeknight meals are a must in our home, and if they’re meals that we can cook once and eat twice, all the better. These Black Bean & Pepper Jack Stuffed Peppers fall into that category — they’re super easy to make, and the leftovers taste even better a day or two later, after the spices and veggies have really had a chance to mingle. My family loves big Southwest flavors, so one of my go-to peppers is the poblano — a mild chili pepper often used in Mexican and Southwestern cooking. Most of the time, poblano peppers are used when they’re green, but if they’re left on the plant to fully ripen, the result is a hotter, red pepper. 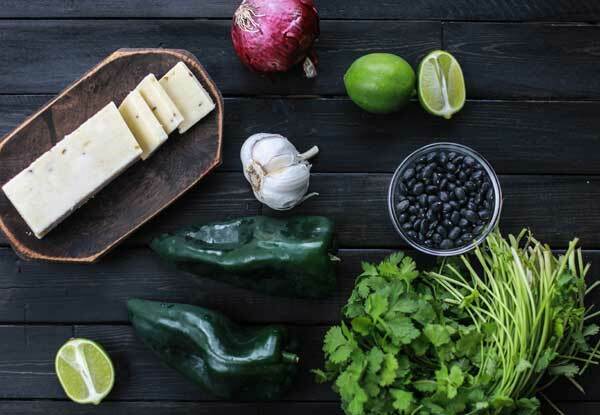 Poblanos are perhaps most well known for their role in the classic chile relleno, in which they are roasted, stuffed with cheese, then coated in egg and fried. When you’re buying poblanos, look for peppers that are firm, with no bruising, and that feel heavy for their size. The skin should be dark in color and it shouldn’t be wrinkled, which is a sign that a pepper is past its prime! With their thick skin, poblanos lend themselves particularly well to stuffing. For these stuffed peppers, adapted from a recipe in Better Homes & Gardens, the filling is a hearty mix of black beans, red onion, jalapeno jack cheese, spices, and cornmeal all mixed together with a little vegetable broth. The rich tomato-based sauce that bakes along with the peppers is a quick and simple blender sauce that’s perfect spooned back over the peppers after they’re dished up. Then — the best part of all — just refrigerate the leftovers, and a delicious next-day lunch or dinner awaits! 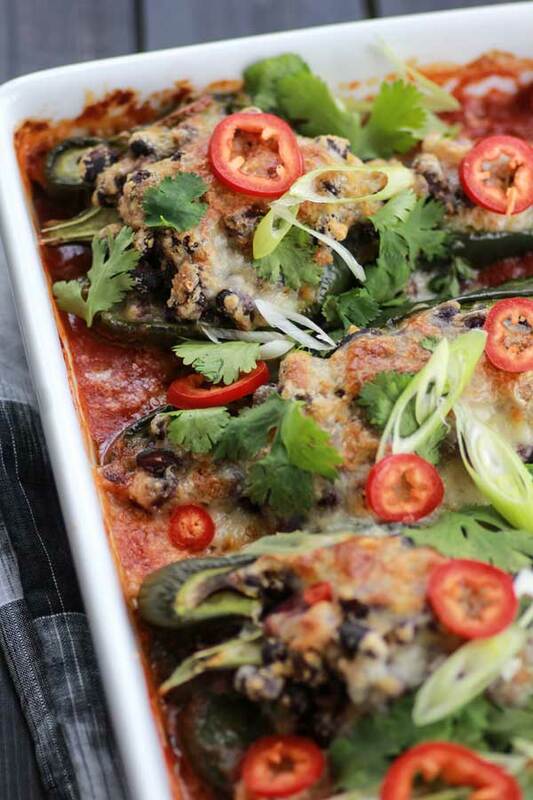 Hearty black beans and melty pepper jack cheese stuffed inside poblano peppers, and then baked to perfection atop a zesty sauce. 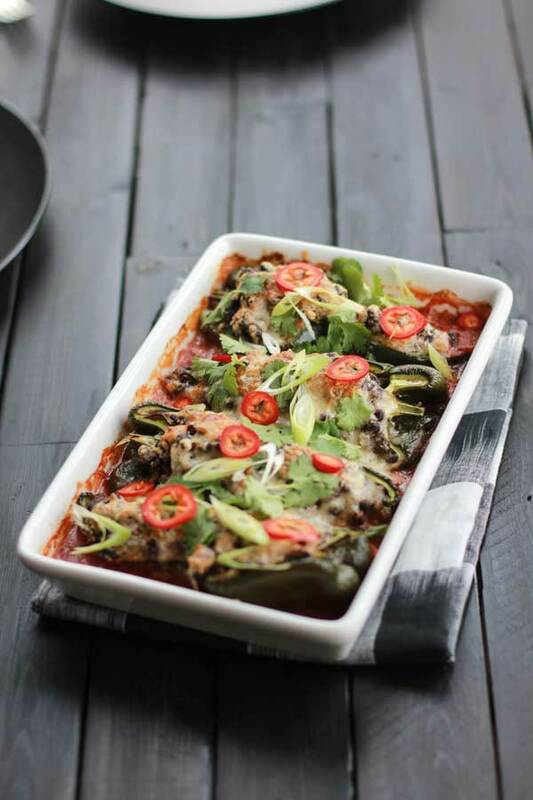 Adapted from Better Homes & Gardens’ Poblanos Stuffed with Black Beans. In a blender or food processor fitted with the S-blade, combine the crushed tomatoes, onion, jalapeño, garlic, salt, and oregano. Cover and blend until smooth. Pour the sauce into a large 9 x 13-inch baking dish. In a large mixing bowl, combine the black beans, 1 cup of cheese, vegetable broth, cornmeal, onion, coriander, cumin, salt, and pepper. The mixture will seem wet, but it will firm up while baking. Place the poblano halves on top of the sauce in the baking dish. Use a spoon to stuff the bean filling into each poblano half. Cover the dish tightly with foil and bake for 30 minutes. Remove the foil and sprinkle the remaining 1/2 cup of cheese over the top of the peppers. Bake, uncovered, until the cheese has melted, 5-8 minutes more. Top with cilantro, green onions, and pickled peppers before serving. It’s been ages since I’ve had stuffed peppers and I’m ALWAYS up for some southwestern flair! These look like such a great meal. I’ma get me some non-wrinkled poblanos and go to town on this meal! I hope you enjoy these stuffed peppers as much as we do Julia! I got all the ingredients in my pantry!! Need to try this! Yum! This dish has some of my favorite flavors/ingredients in it. I am definitely Pinning this one for later! I love stuffed peppers, these look incredible! The sauce! … oh the sauce sounds fantastic! And with the stuffed pablanos!? Whaaaa? Beautiful and inspirational recipe! Thank you so much! Pinned. I can definitely say that my all the people in my office LOVED this recipe when I brought in the leftovers from testing it. They are eating it right now and are all raving about how good it is! Two thumbs up! Jenna that makes me so happy!! Thank you SO much for taking the time to comment. I love that your co-workers are digging the leftovers! Tex-Mex flavors always go over super well in my kitchen and they end up being some of my favorite leftovers! I can’t wait to try these poblanos. And I had no idea that they eventually turn into a red pepper if left for long enough! Learn something new every day. Meg! I made this recipe for dinner this evening and OMGOODNESS, it was heavenly! Instead of two cans of black beans, I used one can black beans and one can of pinto beans. The homemade sauce is really vibrant and full of flavor. Using fire roasted diced tomatoes is a must! These are filling, as the cornmeal in the filling mixture mixed with the beans and cheese is so satisfying! I ate one and I was so full and satisfied, and it doesn’t sit heavy in your stomach. Also, I used pickled jalapeños and pickled mild yellow pepper rings along with fresh cilantro to top it off. Perfection! Just finished the dishes this recipe was amazing! Super delicious and satisfying, the veggie broth and cornmeal made an almost meaty texture which was unexpected and excellent. Went through a bunch of recipes before I found this one, glad I made it. Can’t wait to devour the leftovers! Do you have to take the skin off the poblano? How do you steam them? Thanks! you do not have to steam them or remove the skins. just cut off the stems and remove the seeds. eating my leftovers right now! this was fantastic and something i will make all of the time. very easy and seems relatively healthy (unless you add extra cheese like i did!). thanks for a very flavorful recipe that will satisfy meat-eaters and vegetarians alike. This may be a silly question… but I’m so excited about this recipe that I don’t want to make a mistake! The recipe says 4 poblano peppers, but it looks like the pictures only show 2. Is it 4 whole peppers, or 4 halves? Thanks in advance – I’m anxious to try it! This sounds wonderful! Do you think it can be made ahead of time on the weekend, refrigerated and baked later for weeknight dinner? I think that would definitely work! This meal was very delicious and easy to make! I would say that corn meal isn’t something I use often, and was thrown off by the ratio of corn meal to the rest of the ingredients. I would suggest using half the amount suggested, or to substitute with quinoa or couscous.